In a discussion initially suggested by Eric Foxley, Imperial War Museum (IWM) asked members of Art Detective to provide more information about the war artist ‘B. Gordon Smith’, Royal Signals Unit, Second World War, and in particular, his Twickenham connection during the 1950s. Eric Foxley had lost touch with the artist Bernard Gordon Smith, who was his father's best man in 1930. Early speculation focussed on the uniforms depicted in the painting: one contributor thought that from the young girl’s attire the painting is of the First World War. Osmond Bullock disagreed, as that cloaks and capes fastened with crossed red tapes only appeared in the 1930s or 1940s, with some student nurses wearing them for decades after. Osmund then notes that the recording of the artist as ‘Gordon B. Smith’ when purchased in 1941 is confusing, as another 1941 work in the collection, a watercolour, attributed to ‘Gordon Smith’, may be the same artist. 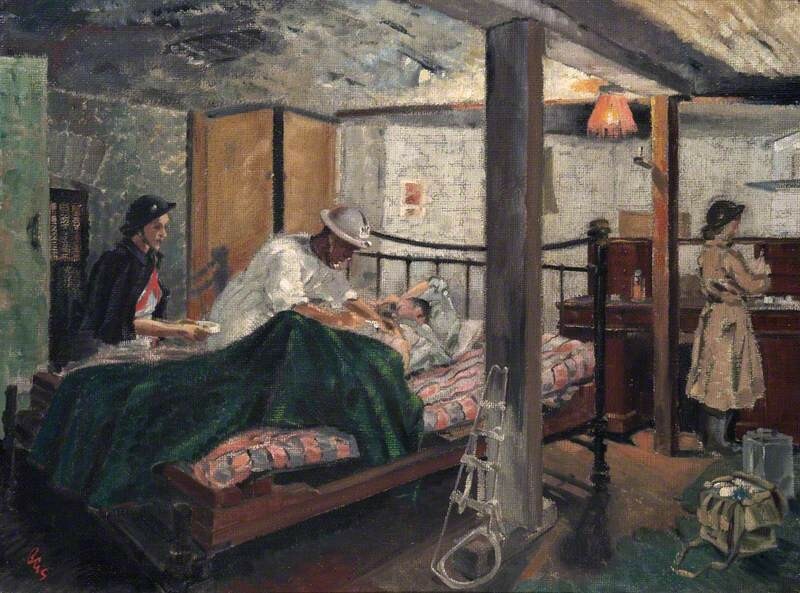 It was a gift from ‘Mrs M. Smith’ to IWM in 1998, presumed to be the artist’s widow. Eric Foxley confirms that his acquaintance Bernard Gordon Smith’s wife Marjorie outlived him and died in Norfolk. Anthony Lester wondered whether it is the same ‘B. Gordon Smith’ who exhibited ‘The Leven at Dumbarton’ at the RA in 1935, with an address in 59 Chepstow Place, London, and who exhibited two pictures at the Royal Society of British Artists. Eric confirmed the address is that of ‘Bernard Gordon Smith’, whom he visited as a child. Osmund describes ‘B. Gordon Smith’ as a book illustrator and designer in the 1940s/1950s, and suspects that the other ‘B. Gordon Smith’ of Twickenham is the same man, who lived at 65 Pope's Avenue from c.1952–1981, and was listed in the West Middlesex telephone directory, with the initials ‘MSIA’ after his name, for Member of the Society of Industrial Artists. Eric confirms this, plus his musical associations. These comments indicate the two ‘Gordon Smiths’ are the same person, and lead to a call for further research at IWM’s archive, to provide the final connecting proof of Bernard Gordon Smith’s 1941 address. IWM accepted the conclusion, thanked contributors, and added new information retrieved from the WWII archives sent to IWM, confirming that the ‘Gordon B. Smith’ file is there. The record ‘B. Gordon Smith’ is proven to be an administrative error. All records are now changed to ‘Bernard Gordon Smith (1908–1983)’, and firmly linked to three works in the collection.